The Utah Department of Transportation is investigating the effect on the life span of bridges of using rods made of glass-fiber-reinforced polymer (GFRP) in bridge decks. The GFRP rods resist corrosion by deicing salts, and so may extend the life span of the deck from 45 to 100 years. Corrosion resistance is the biggest factor in reducing the long-term cost of bridge decks. The Beaver Creek Bridge was constructed using accelerated bridge construction with prestressed concrete girders and precast concrete deck panels reinforced with GFRP bars. 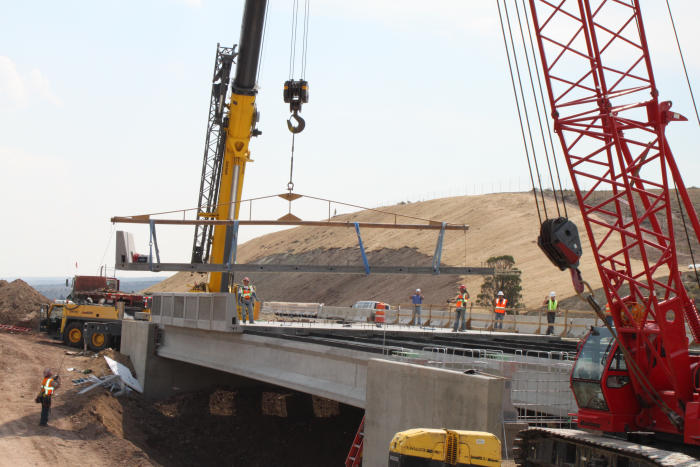 The University of Utah (U of U) instrumented the bridge during construction and performed tests to determine if the new construction materials and methods provided the required performance. The camera recorded images of the vehicles that caused the greatest acceleration measurements. The researchers also installed linear-variable-differential transducers (LVDTs) above the diaphragms between the girders to measure deflection of the deck. During the load tests, they also used surveying equipment to measure deflection of the girders. The project used an AVW200 Vibrating-Wire Interface (to manage signals from the VWSGs), three AM16/32A multiplexers, two CR3000 Microloggers, and one CR1000 datalogger. During lifting and transportation of the deck panels, the dataloggers transmitted the recorded data to a laptop using RF401 radios. For the truck load tests the dataloggers were connected directly to the laptop. For the long-term monitoring portion of the project, a cell modem connected the dataloggers to the Internet, allowing data to be retrieved from anyplace with Internet access. Collected data includes concrete strains in the deck panels, relative displacements of the panels with respect to the girders, and vertical accelerations. Using the curvature, displacement, and acceleration parameters, conclusions were made regarding the response of the deck and the girders by comparing test results to design requirements, as well as to finite element analyses from computer-generated models. Computer-generated models of the bridge showed the flexural response of the deck panels, the dynamic response relative to the location of vehicles, and the static relative displacements at mid span. It was shown that after two years in service, the performance of the bridge, including the precast deck, was well within the design requirements. James Ries, "Health Monitoring of Precast Bridge Deck Panels Reinforced With Glass Fiber Reinforced Polymer Bars." MS thesis, University of Utah, 2011.